LONDON, England (CNN) -- A massive fire engulfed the four-story offices of a major film company in central London on Friday, sending clouds of white smoke over the city skyline, the London fire department said. Streets in London were cordoned off while firefighters tackled the blaze. Two firefighters were taken to the hospital with minor injuries as a result of the blaze in the Future Films building on Dean Street in the city's Soho district, London ambulance services said. 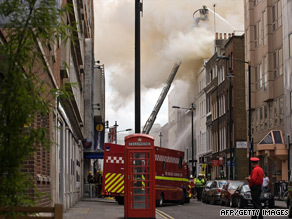 The London Fire Brigade dispatched 12 engines and 55 firefighters to battle the fire, which began before 2 p.m. (9 a.m. ET). As a result, an adjacent street -- the W1 -- has been closed to traffic and pedestrians. When reached by CNN, Future Films founder and managing director Stephen Margolis had no comment about the fire. Future Films has been involved in the production of more than 120 films since Margolis created the company in 2000, including "Bend it like Beckham" (2002), "The Importance of Being Earnest" (2002), and "Transsiberian" (2008). CNN's Per Nyberg and Laura Perez Maestro contributed to this report.